Sign up and receive Property Email Alerts of Apartments for sale in Claremont Upper, Cape Town. TOP UPMARKET FLAT - GREAT INVESTMENT! The Herschel needs no introduction to the discerning resident. It offers all the facilities, sophistication and security expected of a property of this calibre and facilitates a unique lifestyle. 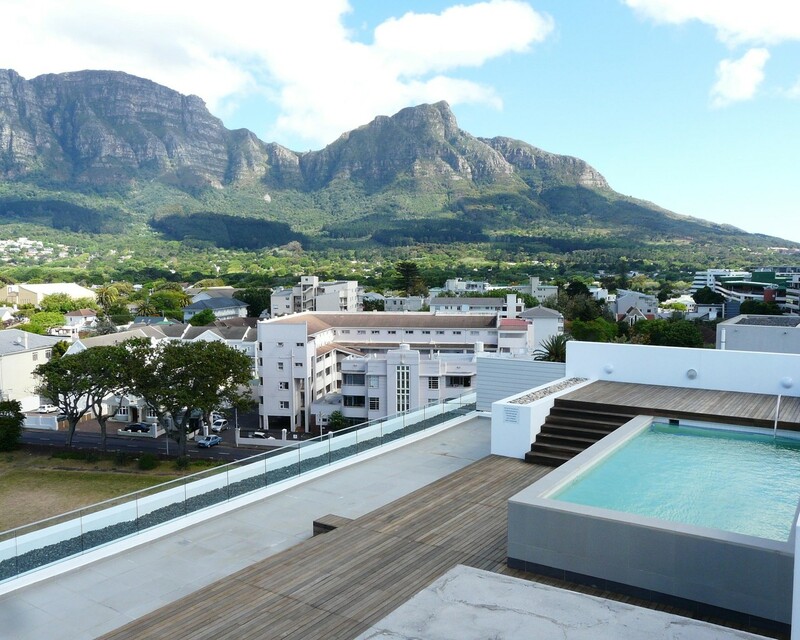 Stunning modern 2 bedroom, 2 bathroom (m.e.s) apartment on 6th floor with magnificent views across the Southern Suburbs and the Boland Mountains in the distance. Open-plan living area with modern kitchen, fitted with granite tops, tiled floors, built-in oven with glass hob and space for fridge and an appliance. The living room has air-conditioning and laminated wooden floors with sliding doors, opening to a small balcony with sliding shutters and blinds. This is an exceptionally high-quality flat with top finishes throughout. A rooftop deck, which showcases an incredible visual panorama and unique mountain views, braai facilities, sun-loungers, dining tables and swimming pool. The complex has another braai area on ground floor with lawn. 2 Basement parking bays. There is a concierge at the entrance for your added security. Set in upmarket Claremont, the complex is within walking distance of the Cavendish Mall. When you view the apartment you will feel spoilt, and it is centrally located making it a great investment potential for the future. Sign-up and receive Property Email Alerts of Apartments for sale in Claremont Upper, Cape Town.